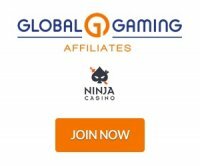 Note: Be cautious in working with this program as they have a reputation of late affiliate payments with reports that some of the Gaffg trusted affiliates haven't been paid with emails not being answered. BetCave Affiliates represents a fairly new casino group of Rival powered online casinos. At the moment the casinos do not accept players from Canada or the United States but do accept worldwide traffic. The casinos are all licensed and regulated in Curacao. There is no negative carry over at the affiliate program with payments made every month. The revenue share commission rates are high at 40%. If you refer other affiliates to the program you can get 10% sub affiliate commission. Affiliate payments are available in most ewallets including Neteller, EcoCard and Skrill. You can also withdraw via player account. The affiliate dashboard is powered by Rival backend software and provides statistics on the current month. The campaign manager is where you get all your flash and gif banners plus text links. You can update your information in the 'edit your profile' link. The reporting section provides you with feedback on your players and commissions. The affiliate program provides 3 different casinos for affiliates to promote. There is no negative carry over with a 40% revenue share rate.